There seems to have been quite a lot of noise about live video streaming services over the last week or so, since Twitter-owned Periscope launched, inviting us to “Explore the world through someone else’s eyes”. 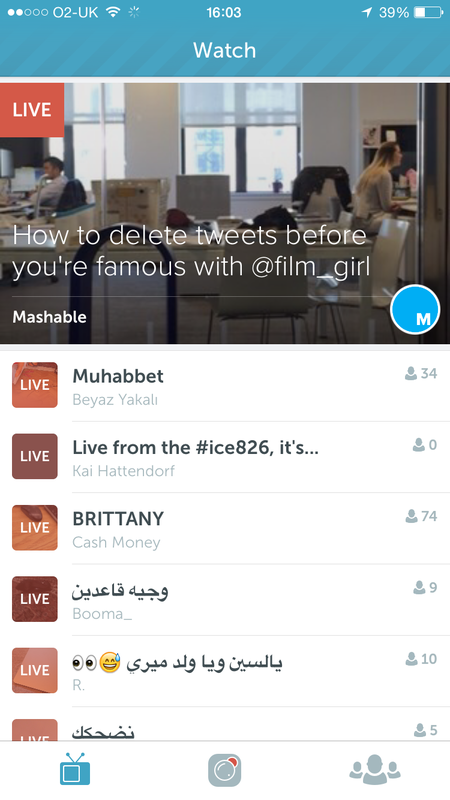 Video streaming has been hitting the headlines since Meerkat was the talk of this year’s SXSW. I have to confess this totally passed me by, but as a Twitter user, I found out about the launch of Periscope so decided to have a look and see what it was all about. If you’ve not had chance to download and have a play yet, here are some screen grabs from the iOS app (not available on android at time of writing). I’ve chosen an example from the folks at Mashable to help demonstrate the app’s potential for marketing and engagement. You can tell it’s in a very early stage of experimentation by many users, with ‘test’ or ‘view from [location]’ type titles of the streams, but I’ve already watched useful broadcasts from Guardian Tech and Mashable that help showcase its potential. 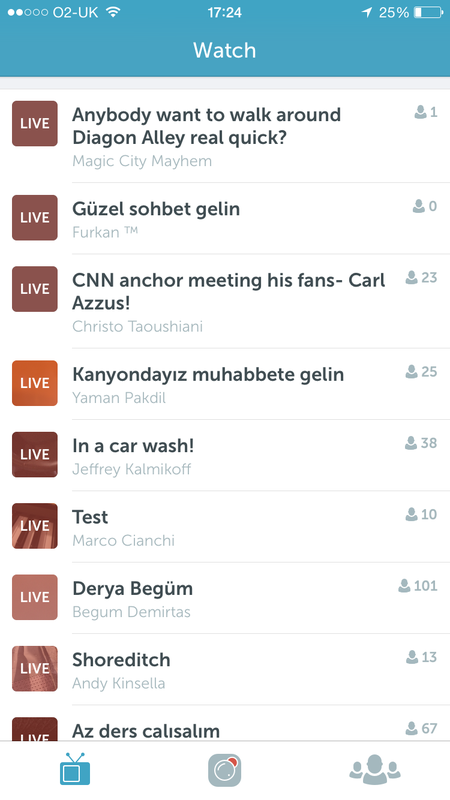 Viewers of these live broadcasts can make comments or show their ‘love’ by tapping the screen and generating a heart which floats up the screen along with those of other viewers. For the time being, though, these are offset by some pretty significant cons. Search: At the moment, it seems that you can search for users but not content. This seems a pretty fundamental flaw for me, as discovery of new users to follow will be driven by [for me, anyway] by an interest in certain types of content, language or even location. The home screen of the app is too random at present – a list that is crying out to be filtered into a curated list of stuff I actually might find interesting, that I can choose. Bandwidth: On more than one occasion, on separate streams, I’ve seen ‘broadcast too full’ with as few as 157 [see below] live viewers of a stream. Again, I’d hope that this would be something that gets improved over time as more people adopt the platform. I’m left with no doubt that the ability to video stream in real time has lots of exciting possibilities but, as with all forms of social media, the starting point has to be in how best to deliver benefits for the audience. One good example I’ve seen is from @pauljholden, a Comic Artist on Judge Dredd who I’ve seen broadcast a couple of times, answering questions whilst you can see him at work. As with any form of social media channel, I’d always recommend to clients that they should listen, observe and learn about any platform before diving in. The focus on live video streaming (of any flavour) will only gather pace over the coming weeks and months as brands begin to experiment and find the use case best suited to their audience. I’ll return to this in a later post, but in the meantime I’d love to hear from anyone who is thinking of incorporating Periscope (or Meerkat) into their communications plans. Where do you see the opportunities and potential pitfalls? 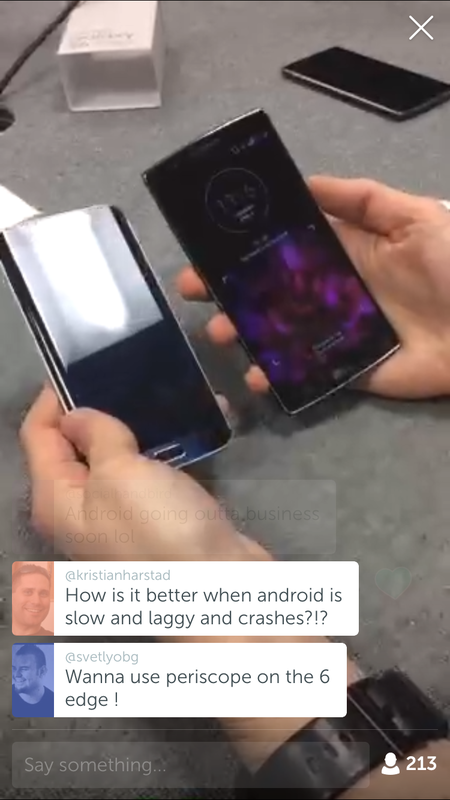 This entry was posted in Digital Marketing, Social Media and tagged 'online video', 'social media', 'Steve Revill', marketing, marketing consultant in st albans, meerkat, periscope on April 7, 2015 by Steve Revill. I love facts, me. Hard, numbers-based evidence. As marketing professionals, it’s this objective assessment of the relevance or performance of campaigns and channels that stops us being perceived as ‘fluffy’ by our colleagues in other functions. Which is why I loved every one of the 34 minutes of Mark Ritson’s recent speech at Melbourne Business School. The scope of his presentation was how social media is used by brands to communicate to target customers in Australia. According to Mark, social media has been the “Greatest act of overselling in the history of marketing” – meaning that its value for brand communications has been drastically overstated for what is a primarily social (person to person) media. If you look at the top 10 brands in Australia, the number of Facebook likes as a proportion of their total customer base was 2-3% – so 97% of customers are not engaged (have hit ‘like’ at some point) with the brands on Facebook. It gets worse. The proportion of the customer base that had recently engaged with the brands’ content on Facebook in the last 7 days was just 0.02%. Add to this the fact that as few as 20% of users turn to social media to research brands (meaning 80% don’t) and the picture starts to build that for all the fanfares, noise and excitement about the growth of social media, the jury is well and truly out on its use as an effective brand (b2c) communication. Take a look for yourself – I’d love to hear your thoughts on this. This entry was posted in Social Media and tagged 'social media', 'Steve Revill', facebook, mark ritson, marketing, ritson vs. social media, twitter on January 21, 2015 by Steve Revill. What do you think about Twitter’s move? Are there any downsides for users? Do you have a digital publishing strategy or any digital personal brand guidelines? This entry was posted in Digital Marketing, Digital personal brand, Social Media and tagged 'social media', Business networking, digital personal brand, linkedin, TweetDeck, twitter on June 30, 2012 by Steve Revill. We marketers sometimes forget that we also have personal brands that need building and managing. So it was great to be able to spend a day reflecting on this last week with a range of digital marketing and personal branding gurus at Digital Empower Conference 2012. The packed agenda was too extensive to do justice in a blog post, but I’d like to share my key takeaways for those who weren’t able to make it. At the time of posting, slides from the day were still available from MMC Learning. I’m sure the proportions might cause some debate, but I agree completely that the importance of having a visible personal brand (on and offline) has never been more vital than it is today. He urged us to think as we would with any brand – know who you’re targeting, offer value as well as being visible and show you’re the solution to the problem they have. 1) Commit to having a strategy and resourcing it. 62.73% of businesses don’t have a strategy. Think of yourself as a publisher- who are you competing against? Peers? Other news sources? Other consultants? 2) Know what you want...your brand goals. You can’t build a credible personal brand without developing long form content. Therefore you must have a blog to develop a personal brand online. 3) Find your audience and specialism tools such as Ubersuggest and Tweetlevel will help you to find topics on which you can develop content. 4) Create your target personas. Develop 2 or 3 personas for people you’re writing your blog for. Be more understanding of the pain points facing your users. 5) Define your personality. It’s worth investing in the template for your blog, helping you to stand out and be more credible, rather than standard WordPress themes. 6) Define your online value proposition. Define your core brand proposition first…what can you offer? What you do? Where you do it? What makes you different? Have this in a side bar visible on EVERY PAGE. 7) Create your content publishing approach. Have a contract with yourself on how often you’ll update your blog. 8) Growing your footprint through Social Media – resources such as the CIM’s Social Media Benchmark will help you keep up to date on latest trends in adoption and usage. 10) Define your publishing platforms – define what you’ll do on which platform. Be aware that marketers often chase the latest new thing, and be careful how much time you commit to anything other than the established networks. Following lunch, David James kicked off the afternoon session with “Marketing Me: the truth told better”. This involved eating cat food, as he used to be known as “the cat food man”. A high impact (albeit slightly bizarre) way to kick off the afternoon but he had the audience hanging on his every word as he talked of his experience of ‘being different’ in order to stand out and build his own personal brand. He built a strong argument for standing out in a crowded market – by being different. He has talked about the management styles of drug dealers and Osama Bin Laden- making him different and enabling him to stand out. Very thought-provoking stuff. Diving into and absorbing his deck from the day will be well worth half an hour of your time. After another session from Dave Chaffey on 21 ideas for effective blogging (check out the deck), Peter Rees called on marketers to “cull the dull” in thought leadership and innovate to be something different and better than the competition. Become a deep expert in your field- thought provoking, maybe even contentious- but not lists of ‘5 this’ or ’10 that’. Be in it for the long haul and commit to updating/maintaining on a regular basis. Kevin Read at Bell Pottinger Business & Brand gave the PR agency perspective of having planned communications across a wide range of global clients and sectors. Reputation as an issue is now owned by the board, which wasn’t the case 10-20 years ago. Digital media has caused us to think differently about reputation management, but there’s no single, correct answer, according to Kevin. Whether or not digital and traditional communications teams would/should merge is a subject of much debate, but Kevin advocates that synergy comes from the best of both. Finally, but by no means least, Marialena Zinopoulou discussed her 10 most inspirational online influencers. Once again, the deck is well worth a look and in many ways this session might have worked better in the morning as the content links so strongly to Lesley and Mike’s- these are the guys who have been there and done it! Overall, I thought the day was extremely valuable and thought provoking and I’d highly recommend you look out for DECon2013…by which time I may have had chance to implement some of this best practice advice! I’d be interested to hear any thoughts or reactions from readers, whether or not you were at the conference. How important do you feel developing your personal brand is? What are the barriers to you achieving this (real or perceived)? Do you have any examples of success stories you can share here? This entry was posted in Digital Marketing, Social Media and tagged #DECon2012, 'social media', Annmarie Hanlon, Dave Chaffey, David James, Digital Empower Conference, Imran Farooq, Kevin Read, Lesley Everett, Marialena Zinopoulou, Mike Berry, personal branding, Peter Rees on June 26, 2012 by Steve Revill.